Founded by Al Fink in 1979, Stingray is renowned as one of the most technologically advanced companies in the boating industry. State-of-the-art robotic production has resulted in many of their award-winning designs. Combining skilled craftsmen and a dedication for excellence, the company consists of over 20 models that excel in quality and performance. In every phase of the building process, Stingray integrates both skilled craftsmen and advanced technology. At Stingray, Computer designs create a model for the fiberglass. The major components are examined by reviewing parameters and adjustments are specifically made for each design. This process prepares the computer model for the next step, the 3D milling. The Stingray design team uses a three-dimensional milling machine to cut and study scale models of intended parts. All parts within Stingray are moved within the facility through a unique overhead tram system. Many of the parts on a Stingray boat are cut with a water-jet cutting machine. This process ensures precision cutting that result in quality parts. Since cutting irregular shapes is challenging, Stingray uses a CNC Router. This computerized system groups the parts to minimize waste. The CNC Router is used for cabin doors and interior parts. These are just a few of the ways that Stingray uses cutting-edge technology to produce high-performance boats. In addition to advanced technology, there are other numerous distinctions that separate Stingray from the crowd. Ergonomic design based on engineering data ensures adequate head and leg room, convenient location of controls and great comfort. Pressure-treated woods and a thorough lamination process protect the outside layers from termites and abrasions. 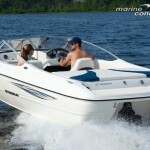 Stingray has revolutionized the marine industry with their Z-plane design. While many other brands incorporate dinosaur technology, this company continues to set the bar high and outperform its own benchmarks. Z-planes act as a spray release and the design crosses through the water with no vortices shaped by the hull. Developed by their Computer Aided Design system, the Z-plane ensures a smooth flow of water during straight line speed and turning maneuvers. Drag is reduced and performance is increased, including fuel reduction. Whether an open bow, cruiser or sport deck boat, you can expect any Stingray model to be packed with features that excel the norm. The 185L open bow is a compact boat with an abundance of luxury features. At the helm, you’ll find a designer Dino Italian wheel sporting an array of navigation instruments and trimmed in rich grains. Details abound, such as the digital-hour meter and a 12-volt receptacle to charge spotlights, cell phones and accessories. On the passenger side, there’s a shelf to mount electronics and a steel grab rail. With a wide and long bow, solid steel rails line the perimeter. Stingray leaves nothing to chance and integrates sleek style with perfect function. 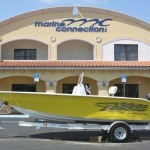 Marine Connection is located in south Florida and features many models of Stingray, new and used. 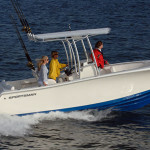 We have been selling and exporting boats since 1987 and are renowned dealers for professional and friendly service. With an expansive inventory of brand boats, Marine Connection can help you in the purchase, sale, financing or export of your boat. 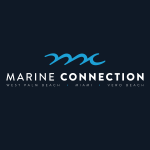 Contact the experienced staff at Marine Connection today for all your boating needs. 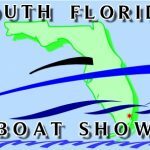 Marine Connection welcomes Sportsman Boats!